Who are we and what do we do? An IT company with a passion for what we do. We make sure our clients get the best service we can provide...whether you employ 1 person or 1000, our service to you is the same. Since taking over MCWare in 2013, MCWare IT Solutions has been going from strength to strength. We have customers we have supported since the company was formed; many of our new customers often come from recommendation and referral. We work to providing solutions for now and growth for the future. We treat every customer as an individual, we recognise that no two companies are the same and as such all have different requirements. We spend the time to get to know your business, we provide support and consultancy and work closely with you to understand your requirements and provide the best solutions to meet your needs.  Our commitment to providing quality service and best practice is endorsed by our certificate in ISO9001 and ISO27001. Our staff of certified Engineers and Technicians, which include specialists in Microsoft, Cisco, Citrix, VMWare and Mitel, work to ensure our customers are getting the finest service delivered with honesty and integrity. Although you will have a dedicated account manager we share our experiences and work as a team, in the event of a major problem we will have a team of engineers working to resolve the problem and have you back up and running at the earliest opportunity. In the event of major disaster we can provide an offsite office where business can carry on for the crucial people allowing you to keep customers and suppliers advised of the situation. We welcome the opportunity to discuss your requirements, please contact us and we will be happy to assist.